If you are having trouble getting a home plug setup to deliver the through-put that you need, or if you are trying to determine what you can expect from some products that you are thinking of buying, then the following notes may help. Before we look at these points in detail we’ll have a quick look at the technology in general. home plug passes data through the mains system using a tiny radio signal. Unlike Wi-Fi, which sends radio signals through space in every direction, home plug targets the signal along the mains wires, carefully tailoring the signal it sends by negotiation with the device at the other end. As a result of this home plug needs 30 million times less radio power than Wi-Fi! The reduction in radio power may give comfort to anyone who is concerned about the radiation of Wi-Fi devices and mobile phones. The lower frequencies used by home plug, which are in the Medium to Short-wave range, may also be considered safer than those used by the other technologies which are closer to those used in microwave ovens. The maximum distance between home plug devices is sometimes quoted as 300 metres. At Solwise we feel this is a bit optimistic though we have seen such distances achieved in some special circumstances and at reduced data rates. For instance we know of a customer who needed a security camera at his gate which was at the end of a 300m drive. By installing a home plug adapter at each end of the buried cable which supplied power to the gates lighting he was able to make a successful connection from the house to with an IP camera at the gate. As we know, home plug sends its data using a tiny radio signal, passed into the mains wiring of the building. Each time the signal arrives at a T-junction in the wiring, the signal is split to the left and to the right, getting weaker as it goes. Each junction also causes some of the radio signal to be reflected back in the direction it came from. Reflections are also caused by any dead-end that the signal encounters. The effect is like shouting in a complex maze of underground passageways. Now, Solwise home plug Devices are excellent at recovering a signal from the complicated ‘mush’ which arrives at the receiving end, but there is a limit. Generally, home plug works well in a typical or even large home but sometimes suffers when wiring is especially complicated. For instance houses with more than one consumer unit (fuse-board) occasionally prove difficult. Commercial buildings such as offices often require experimentation before settling on home plug as a networking solution. In particular premises with a 3-phase electrical supply may need extra thought as the home plug usually (but not always) fails to pass between phases. It is also worth bearing in mind that home plug signals don’t usually (but sometimes do) pass though the electricity meter. This might be important in multi-occupancy buildings such as apartment blocks. There is one more consideration in the wiring complexity category: Extension Leads. Standard extension leads will contribute to the complexity of the wiring as described above. However if an extension leads is marked as ‘Surge Arresting’, ‘Noise Suppressing’ or similar, it may include circuitry which also blocks the HomePlug radio signal. Many modern mains-powered devices produce electrical noise in the radio spectrum used by home plug. In particular the ‘Switch-Mode’ power supplies in mobile-phone chargers and similar products can cause problems. Usually these devices only interfere with home plug reception when plugged in within a metre or so of the home plug adapter. If you are experiencing problems, try un-plugging some devices which are near the home plug Adapter and see if things improve. Sometimes a little re-arrangement of the plugs and sockets can make a big difference. 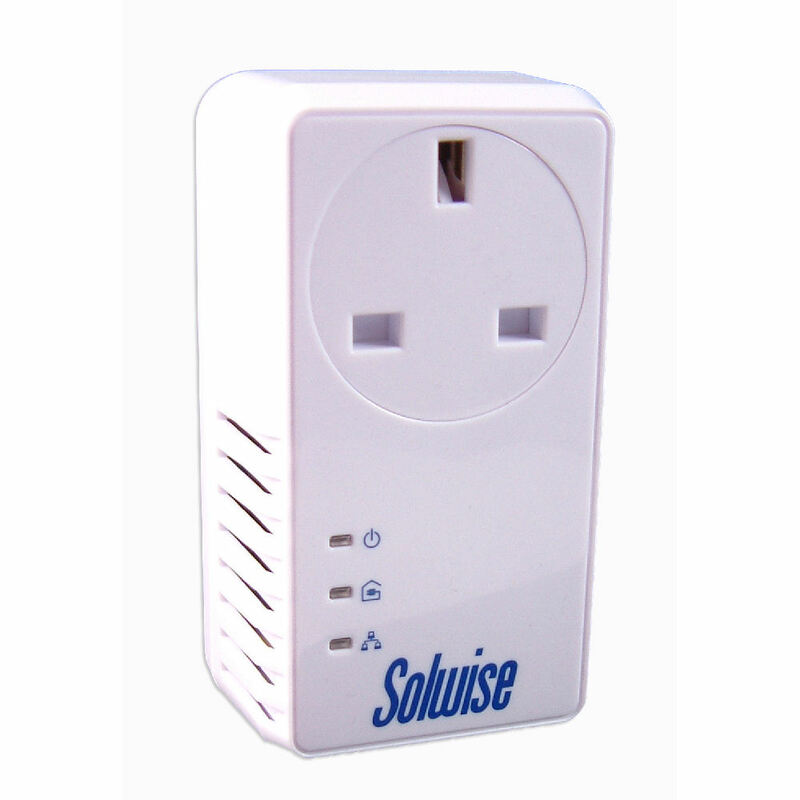 One way to minimize issues with electrical noise is to use Solwise ‘Piggy’ home plug adapters. Piggies have a mains pass through connector (13A socket) so that another device can take its power from there. Superficially this may just seem to be a way of gaining an extra mains point, effectively the home plug adapter doesn’t consume a socket. But there is more to it. The pass-through socket on the back of a Piggy is filtered to prevent noise-generating equipment interfering with the home plug signal. For instance you could have a TV, a games machine and a mobile phone charger plugged into a trailing mains extension lead, which in turn is connected to the back of a Piggy. Any noise generated by the equipment plugged into the trailing lead is filtered out before it reaches the mains, so the home plug service can operate in peace and quiet. Each of the home plug standards has a headline data speed associated with it. For instance, the home plug 200AV standard is associated with 200 megabits per second. It is important to understand that this number does not represent the data throughput between two devices. What the number does describe is the ‘Total, Fully loaded back-bone physical rate’, sometimes called the PHY rate. The data throughput rate between any pair of devices will be significantly less than the PHY rate. There are a number of reasons for this discrepancy, most of which are beyond the scope of this article, but you should understand that it is normal to represent networking equipment this way. For instance a basic Ethernet port which is described as 100Mbps uses a significant portion of its rated speed for internal addressing purposes. This is called packet-overhead. Going back to the home plug standards, a good rule of thumb would be to expect a maximum throughput between a single pair of devices to be about one third of the headline PHY rate. For example you may find that a pair of home plug 200AV devices in a particular setup exchange data at about 60Mbps. Another pair could quite possibly achieve a similar rate at the same time as the first pair, and more capacity is still available on the backbone for extra devices. Each Solwise home plug adapter is supplied with a CD. On this CD is a piece of software called PowerPacket. This is a utility which aids diagnosis of home plug setups. 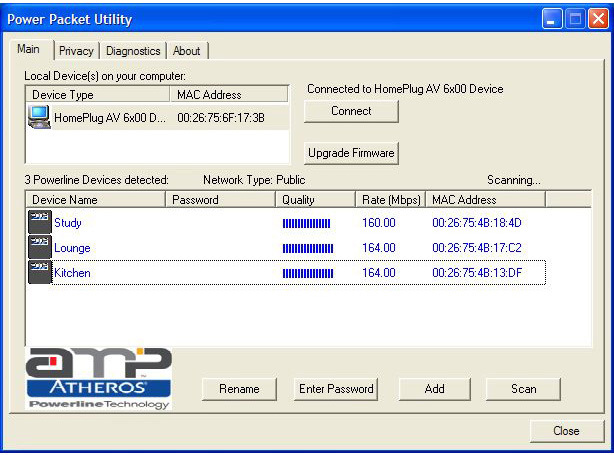 The data rate of the connection with each remote home plug device is shown which makes diagnosis of issues much quicker. As you will realise from the above, the real-world performance of powerline networking devices is a more complex issue than one might expect. From what I have said above you may think it incredible that home plug works at all. And I agree with that analysis. It is incredible, but it does work. At Solwise we tend to say that WiFi gives about 75% of the coverage around a home that the buyer expects or hopes for. Our experience leads us to believe that expectations of Solwise home plug devices are met about 99% of the time. I hope theses notes help you get the most out of your existing or proposed Solwise home plug installation. If you have any questions feel free to contact us, we’re happy to help. Copyright Paul Stephenson, Solwise May 2013- 2019.